Wales back-row Dafydd Jones was a product of the Llanelli academy, making his debut for the full side against Leicester in 1999. Jones covered all three back-row positions during his career, including at international level, but was forced to retire due to injury in 2011. 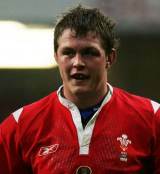 Jones' debut for Wales came in a 58-14 win over Fiji at the Millennium Stadium in 2002. After securing a place in the Wales setup for the 2003 Six Nations, Jones won further caps against England and New Zealand before he was included in Wales' squad for the 2003 World Cup. Jones played five matches during the tournament, scoring a try against Italy, as Wales progressed to the quarter-finals. Jones continued in the Wales back-row through the 2004 Six Nations, and won further caps against Argentina, South Africa, Romania, New Zealand and Japan that year. Jones' involvement in the 2005 Grand Slam was limited to a start in the opening game against England, and his only other appearance of 2005 came against Fiji that autumn. After a substitute appearance against France in the 2006 Six Nations, Jones had to wait through two years of injuries, including a shoulder reconstruction, before his next cap. That shoulder injury eventually put a premature end to his career at the age of 31, as Jones announced he was giving up the game on January 4, 2011.